This area includes routes, peaks and other places within Arthur's Pass National Park. With the opening of the road, and later the Midland railway, came not only fortune hunters but recreation seekers in particular the mountaineers. In December the same year George Mannering, A M Ollivier and W D Wood started their attempt on Mt Rolleston from the Pass via the Goldney Ridge. With visibility poor, they topped out on the Low Peak, realising only some time later they had not succeeded. The High Peak was not climbed until 1912, when H Thompson and I Gilligan climbed it via a snow covered Otira Slide. Notably the first solo climb to the summit was achieved by J Murray that same year. The Waimakariri Valley's slow, wide meanderings and rushing head-waters attracted some notable mountaineering feats. In 1912 Mt Davie was climbed by A P Harper, Eric Harper and George Dennistoun. Mt Murchison and Mt Harper were climbed in 1913 by C K Ward and A E Talbot. In the ensuing years Mt Rolleston received many more climbers, choosing varied routes. B Fraser and W Caldwell made the Þrst ascent from the Bealey Valley in 1923. The first traverse to Waimakariri Col over Mt Rolleston, was made by George Lockwood, R & A Page and Oscar Coberger (a guide at Arthur's Pass) in January 1929. The notorious gap of the Rome Ridge, was first scaled in April 1929 by Oscar Coberger and S Saville. Finally the first winter ascent went to Wyn Barnett and Roland Cant in August 1935. Today the classic route on Mt Rolleston has to be the Otira Face put up by Hec McDowell and John Estall in 1934. Its notoriety being attributed to the many epics (present and past), and tragic losses that colour its short climbing history. In 1925 the Canterbury Tramping Club was formed, the precursor of the Canterbury Mountaineering Club (CMC). They based their activities around the construction of Carrington Hut. During the development of the CMC in the early 1930’s, many notable ascents were accomplished including the first solo ascent of Mt Carrington, achieved, remarkably, by the then 14-year-old C Hilgendorf. Mount Greenlaw was reached in November 1930 by Edgar Williams, R E McInnes and R E Clark via the avalanche-swept slopes out of the Avoca. 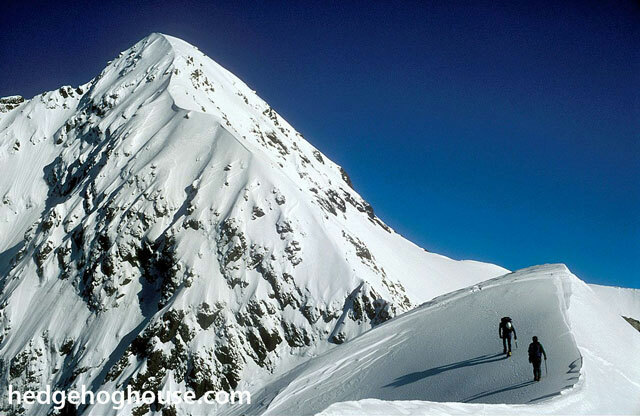 Linked ascents of Mounts Murchison, Harper and Speight in one day from Carrington Hut were achieved by Roger Chester, Wicket and R E McInnes. Mention at this stage must go to the late John Pascoe. His love of the National Park, its mountain environment and his enthusiasm for climbing led him to make several first ascents. With his climbing partner Stan Conway he climbed most of the summits in the Park over a 15 year period. John Pascoe is also renowned for his detailed documentation of various routes on the Parks peaks in his own writings, and trip reports published in the CMC’s Canterbury Mountaineer. Sadly, first ascents in Arthur's Pass National Park have not been well documented. The climbing history is punctuated by 10 year gaps whilst guiding was still active in the area. We can only assume that, of the 50 or so hills, many may have been climbed in these breaks. Today, all that remains for modern day pioneers of rock and vertical, are the obscure remote rock faces dotted about the park. Arthur’s Pass National Park was established in 1929, and has been a centre for weekend mountaineering trips from Christchurch and Greymouth since 1891. Temple Basin skifield was developed between 1923 and 1925, soon after the opening of the trans-alpine railway line, and it is the oldest ski area still operating in the south island. Mountain guide Oscar Coberger arrived in the village in the 1920s and began teaching skiing. Temple Basin’s first rope tow was installed for the 1946 season. The steep and challenging terrain of Arthur’s Pass tends to limit the skiing possibilities. The heavy snowfalls also make this a region of high avalanche danger. Most routes are short, steep and difficult, and access itself demands fitness and commitment. The base for the region is Arthur’s Pass Village, which has a NZAC base lodge, and a Department of Conservation office. DoC Arthur’s Pass, phone (03) 318 9211.